Where is South America ? South America is found in the western hemisphere. Most of the continent is in the southern hemisphere, although some parts of the northern part of the continent fall in the northern hemisphere. The section in the northern hemisphere includes Venezuela, Guyana, French Guiana, Suriname, parts of Brazil, parts of Ecuador, and nearly all of Colombia. The Isthmus of Panama separates North American and South America, where the Darién Mountains are considered to be the dividing line between the two continents. Sometimes, the dividing line is considered to be the Panama Canal. By some classifications, South America is seen as a subcontinent of the Americas. South America has an area of 17,840,000 km2 or almost 11.98% of Earth's total land area. By land area, South America is the world's fourth largest continent after Asia, Africa, and North America. South America is almost twice as big as Europe by land area, and is marginally larger than Russia. South America has coastline that measures around 25,427 km. There are four diffferent time zones in South America: UTC -5, UTC -4, UTC -3, and UTC -2. South America has a population of more than 420,458,044 with a population density of 21 people per km2. With 208.2 million people, the most populated country in South America is Brazil, followed by Colombia with 49.6 million people and Argentina with 43.5 million people. São Paulo, Brazil and Lima, Peru are the biggest cities in South America by population, boasting 12.0 million and 8.8 million people respectively. Other major cities include Bogotá, Colombia (7.8 million), Rio de Janeiro, Brazil (6.5 million), and Santiago, Chile (5.5 million). Think you know your South American countries? Take our quiz! A number of trade agreements exist within South America. Mercosur is an international agreement that exists to promote free trade between certain countries on the continent. Its full members are Argentina, Brazil, Paraguay, and Uruguay. Its associate members are Bolivia, Chile, Peru, Colombia, Ecuador and Suriname. Mercosur was founded by the Treaty of Asunción in 1991, and later was amended by the Treaty of Ouro Preto in 1994. Other organizations include the Union of South America Nations, which consists of 12 countries and has its headquarters in Quito, Ecuador. The Bolivarian Alliance for the Peoples of Our America is an organization which seeks the social, political, and economic integration of countries in both Latin America and the Caribbean. Certain South American countries are also members of the Pacific Alliance, the Organization of American States, the Andean Community, and the Community of Latin American and Caribbean States. The topography of South America has been described to resemble a bowl - it has large mountains around its periphery and an interior that is relatively flat. The continent is mostly made up of lowlands, highlands, and the Andes mountain range, which is the longest mountain range in the world. The Andean Mountains, or Andes, stretch for nearly 7,000 km across the continent, from the top to the bottom. The mountain range passes through Venezuela, Ecuador, Ecuador, Peru, Bolivia, Colombia, Chile, and Argentina. The tallest peak in the Andes is Aconcagua in Argentina, which measures 6,960.8 meters. It is the tallest mountain found outside of Asia. The Amazon River, which flows from west to east across the north-central portion of South America, is the world's largest river in terms of discharge volume. By some definitions, the Amazon River is also the longest river in the world - while the Nile River is generally considered to be the world's longest, some studies suggest an alternative source for the Amazon River, which would actually make it the world's longest. The Amazon Basin (Amazonia) is covered by the largest tropical rain forest in the world, and running through its heart is the Amazon River and its more than 1,000 tributaries, seven of them more than 1,000 miles in length. Measurable rain falls on an average of 200 days a year here, and total rainfall often approaches 100 inches per year. Sparsely populated and positioned high into the Andes of Chile, this somewhat small desert (or plateau) is a cold place, and one of the few deserts on Earth that doesn't receive any rain. It's approximately 100 miles wide and 625 miles long. The landscape is totally barren and covered with small borax lakes, lava flow remnants and saline deposits. The Brazilian Highlights cover about 1,930,511 square miles in eastern, central, and southern Brazil. The highlands have an average elevation of 1,000 metres above sea level. Due to extensive geographical coverage, the highlands are subdivided into the Atlantic, Southern and Central plateaus each with different climatic conditions as well as flora and fauna. Chile's Isla Grande de Tierra del Fuego is the largest island in South America. It covers 18,530 square miles and has a population of over 100,000 people. The second largest of all South American islands is the island of Marajó, which is found in Brazil. Marajó covers 15,500 square miles. Bananal Island, also in Brazil, is the third largest island in South America, covering 7,398.59 square miles. South America is home to a range of climate classifications, from equatorial to tundra. In the north of the continent, near Colombia and Venezuela, weather conditions are generally wet and humid. The same thing goes for areas close to the Equator, including the Amazon Rainforest. Trade winds regulate temperatures in the northeast of the continent, meaning that the climates in Suriname, French Guiana, and Guyana are considerably cooler than their neighbors to the west. In areas of north Argentina and Paraguay, which fall near the Tropic of Capricorn, rainfall is sparse and temperatures tend to be warm. The west coast of the continent, particularly in Chile, tends to be dry and hot in the summer, with snowfall on the mountains in the winter. In the extreme south of Argentina, there is a sub arctic climate. As a general rule, the further south you travel, the cooler the temperatures are (although temperatures can be quite low in the mountainous regions of the continent as well). South America is extremely biodiverse, with numerous unique species of flora and fauna. Some of the most well-known animals that are unique to South America include the world's largest rodent, the capybara, the world's largest flying bird, the Andean condor, and one of the world's largest butterflies, the blur morpho. Five South American countries - namely Brazil, Colombia, Ecuador, Peru, and Venezuela - are recognized as "megadiverse". A megadiverse country is a country who is home to the majority of the world's extant species, and has a significant number of endemic species. There are a number of active territory disputes in South America. Some of these include Guayana Esequiba, which has Guyanese administration but is claimed by Venezuela. The Falkland Islands are currently administered as an Overseas British Territory, but is also claimed by Argentina. The Gulf of Venezuela is currently claimed by both Colombia and Venezuela. The gulf is an important link between both the Caribbean Sea and Lake Maracaibo, the latter of which contains a large amount of crude oil in its basin. Following a period of urbanization that began in the 1930s, South America today is one of the world's most urbanized continents. It is estimated that around 80% of South America's population lives in urban areas (the world average is around 50%). The most urbanized countries in South America are Argentina, Chile, Paraguay, and Peru. South America is a multilingual continent. By total population, the most popular languages are Portuguese and Spanish. Portuguese is mostly spoken in Brazil, which is the most populated country on the continent. 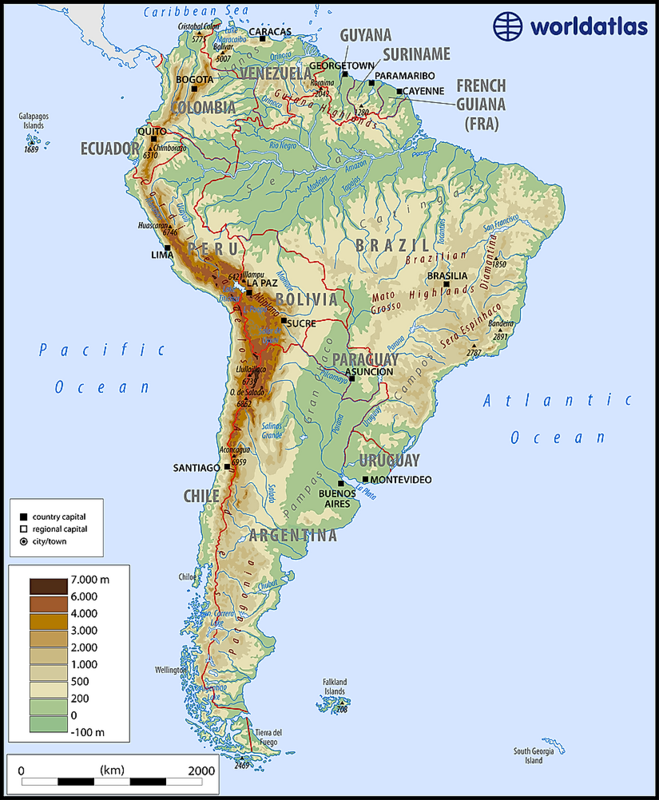 Spanish is spoken by the second-highest number of people in South America, and is the majority language in Argentina, Paraguay, Uruguay, Chile, Colombia, Peru, Ecuador, Venezuela, and Bolivia. French is spoken in the overseas department of France, French Guiana. Dutch is spoken in Suriname. Guyana is the only country in South America with English as the official language. A significant number of indigenous languages are also spoken in South America. The most commonly spoken indigenous language is Quechua, followed by Guarani and Aymara. In countries towards the northern part of the continent, such as Peru, Ecuador and even Bolivia, Quechua languages are more common. In Argentina and Bolivia, and especially in Paraguay, Guarani languages are most often spoken. Other indigenous languages include Aymara, spoken in Bolivia and Peru, and Wayuu, spoken in northern Colombia and northwest Venezuela. Mapudungun is the name of a language spoken in Chile and Argentina. South America is predominantly a continent of Christians. However, nearly half of the continent's population proclaims itself to be non-practicing. The countries claiming the most Christians are Paraguay (96%), Ecuador (93%), Bolivia (93%), and Venezuela (91%). The countries claiming the highest non-religious adherents are Uruguay (51%), Chile (30%), and Colombia (22%). Other minority religions in South American include Judaism, Buddhism, Islam, Hinduism, Baha'i, and Shinto. Every country in South America recognizes the separation of church and state. South American flags are a visual representation of each country’s unique identity. Many of these flags share similarities due to a shared colonial past full of Spanish and Portuguese influence. The flags of Ecuador, Colombia, and Venezuela are particularly similar as they were modelled after the flag of the former state of Gran Colombia. Some flags, such as that of Bolivia, celebrate indigenous culture. Click on the individual country flag to learn more about its design and meaning. Think you know your flags? Take our quiz! There are some anthropological signs that point back to humans inhabiting South America since at least the year 9000 BCE. Throughout South America's early history of human inhabitants, it was widely an agrarian society, meaning that its residents survived off of the land, using staples such as fish and beans for food. Animals like llamas and alpacas were also domesticated around this time. From this agrarian society, early civilizations were born. Out of the settlements that we are today aware of, the earliest ones were in what is modern day Peru. Some of these early cultures included the Chavín, the Norte Chico, the Moche, the Nazca and the Paracas. In later decades, societies such as that of the Incha civilization and the Mapuche, which actually refers to a diverse group of indigenous residents who lived in what is today known as Argentina and Chile. It was the approval of the Treaty of Tordesillas in 1494 that led European explorers to South America. The Treaty of Tordesillas was signed with the intention of allocating land in South America to both Spain and Portugal. With this treaty, all of the land west of the Cape Verde Islands was to go to Spain. However, due to the lack of precision of the era's geography tools, this distinction was not easily enforceable, nor was it always followed. This is why the area that we know now today as Brazil was colonized by the Portuguese. Unfortunately, European settlers brought with them diseases like typhus, influenza and smallpox. The native inhabitants of South America did not have the proper immunities to fight these diseases, and many populations perished as a result. As a way to fill the gap in the (forced) workforce in places like mines, factories, and plantations, enslaved people from Africa were brought over by colonies predominantly controlled by French, Portuguese, and Spanish settlers. The number of enslaved people brought over from Africa to South America during this time is estimated to be around five million. The 19th century saw a great push for independence and decolonization in South America, with every country having gained independence by 1825. The 20th century brought with it military regimes and corruption, as well as a crippling debt crisis. However, it was during this time that South America also underwent a great period of industrialization and advancement. Today, South America is flourishing. The continent's magnificent natural landscape attracts millions of visitors every year, and tourism numbers continue to increase as international flight connections become more available. Economic expectations appear equally optimistic, as South America is on course to become one of the world's next financial powerhouses. A current climate of political stability - with a few expectations - also helps secure South America's promising future. This page was last updated on January 9, 2019.